VEGAPULS 64 is the first radar level sensor for liquids that operates at a frequency of 80 GHz. This delivers superior focusing of the radar beam. This means this level sensor can deliver reliable measurements even in vessels with internal installations such as heating coils and agitators. The narrow radar beam avoids these obstacles altogether and buildup on the vessel wall has no effect on performance either. The larger the dynamic range of a radar sensor, the wider its range of application and the higher its measurement certainty. VEGAPULS 64 is able to measure poorly reflective media with significantly better performance than previous radar sensors; for example, the sensor is able to measure poorly reflective liquids down virtually to the vessel bottom. Even with surface foam, extremely turbulent product surfaces, condensation or buildup on the antenna, VEGAPULS 64 maintains its accuracy and reliability. Download the VEGAPULS 64 brochure here or read about it in the embedded document below. 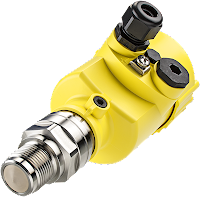 VEGAPULS 64 Radar Level Transmitter from Classic Controls, Inc.